The synergetic success of the Minnesota Orchestra and conductor Osmo Vänskä makes their ongoing Mahler cycle a landmark event—particularly as the news of the maestro’s 2022 departure recently made headlines. 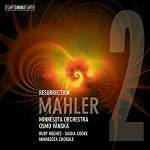 What better way to go out than with a Mahler cycle? From the opening bars of the first movement it is clear that Vänskä and the Minnesota players are on a mission. The brisk tempo of the “Allegro maestoso” is refreshing; the steadiness of the pulse and bite of articulation is a jolting reminder of the functional dirge in Mahler’s first movement. Indeed, at just over 84-minutes (including a long pause after the first movement, imitative of the composer’s instructions), this is one of the more brisk recordings in the catalogue. Yet there is a profound expressivity to Vänskä’s vision. It may be simplistic to suggest that Mahler’s symphony is a struggle between opposing forces: life and death, light and dark, faith and doubt. But Vänskä sets off those forces against each other, providing a reading that is vividly theatrical and moving. Many of the idiosyncrasies of other recordings are gone. For instance, the flute solo at the Etwas drägend in the first movement, a passage that many conductors slow down, presses forward with no halting shaping of phrase. The result is a soaring, expressive motive that easily gives way to the ensuing duet with the violin. Furthermore, Vänskä refuses to belabor the build ups and instead lets the impact of the climax speak for itself. Take, for example, the Molto pesante in the first movement. Vänskä lets the dynamics of the section create the climax itself, providing only the prescribed ritardando in the last bar before the “Tempo I.” It is an effect used often where the transitions are used more as a propellant to launch two knights toward each other in a thrilling joust. The conclusion of the movement is fitting as we are reminded of the descent into death with a rapid tumble to a dormant thud: an inescapable postscript. The Minnesota Orchestra’s playing here is gorgeous and refined throughout. Without excess and with direct tone, they perform an impossibly soft second movement with sentimental glissandos and slurs. The playing and conducting is lyric and song-like in its phrasing. The excellent booklet essay describes this movement as more of a minuet than a Ländler, and the breathtaking rendition here is convincing. Leaving the idyllic past in Mahler’s narrative we find an earnest “Scherzo”. The undulating strings play without a trace of the sardonic wit that typifies this movement. The contrasting brass motive feels more of a continuation of St. Anthony’s proselytizing than a repudiation of it. Yet even still, as the movement hurries toward its climax, the competing motives bring us to the precipice and, as a reward, Sasha Cooke provides us with one of the most beautiful “Urlicht” readings in recent memory. Not only does Cooke sing with seemingly endless vocal line, but an exceptional evenness of tone throughout her range. Vänskä assists by providing a hymn-like, measured tempo giving the movement a satisfying forward direction that refuses to get bogged down in its own beauty and concludes with resplendence. The final movement is as affirming as one could hope. While it characteristically can feel swift and tidy in its “beginning of the end”, it never feels rushed. Simply, Vänskä sounds just more emphatic on striving toward his destination. The violins’ leaping seventh after the slow “Bereite dich zu leben!” sets off an uplifting cascade that continues to soar through the canonic choral entrances that take wing in “Mit Flügeln, die ich mir errungen.” The Minnesota Chorale is in fine form, singing with outstanding precision and power. Ruby Hughes’ soprano is a gleaming addition. The surround SACD sound is immersive, almost a little too much for my taste. While the offstage brass from the rear channels is a thrilling effect, the soundstage felt disorienting with the rear channels primarily used for ambience, but the chorus very present in them during the last movement. The orchestra sounds shallow in the hall without much distance between strings and brass and percussion. On the whole, I prefer the stereo mix of the recording. Both have excellent dynamics and fidelity. Overall there is much that is appealing in Vänskä’s reading. It is unique, persuasive, and leaves the listener eager to hear his next entry into the crowded, but never full, Mahler catalogue.